I love designing and decorating small powder rooms, simply because it is almost so unexpected to walk into the WC and actually find yourself staring at the walls, the furniture, lighting and various accessories. And why neglect the powder room when the rest of the house has been finished beautifully with custom furniture and custom draperies! 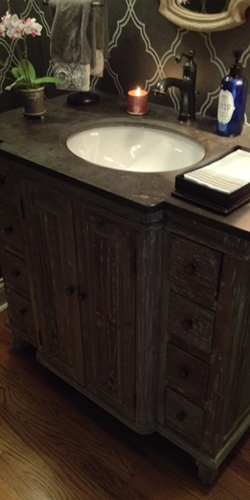 In this case I selected wallpaper with a geometric, raised pattern with a black background – in my opinion, black can be such an amazing color and scream ” I am here and I am not going anywhere!”The vanity came the way it is shown with a white porcelain sink and black stone countertop, as well as a distressed wood finish. 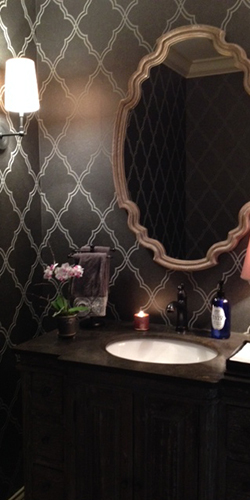 I complimented that with a mirror that matches the finish and the shape plays off the geometric wallpaper pattern as well as the tiny vanity countertop lamp. 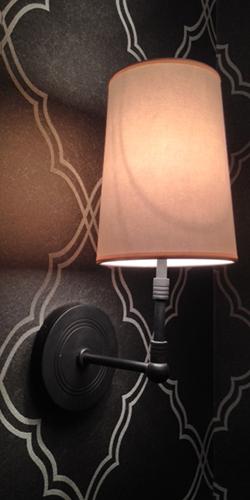 The wall sconces are from Visual Comfort Lighting and their simple and clean lines work perfectly with the rest of the room.